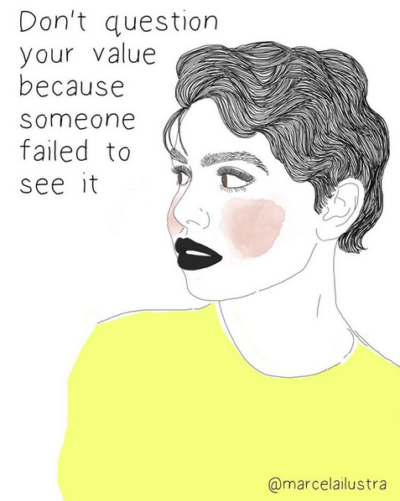 If You Aren’t Following Intersectional Feminist Brazilian Artist Marcela Sabia On Instagram, Do It Now! 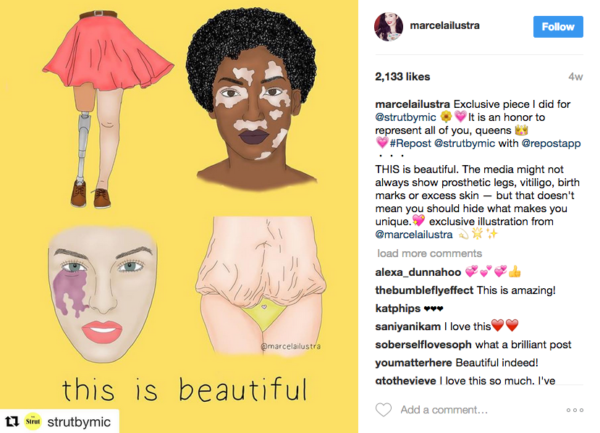 If you are looking for a body-positive, trans-inclusive, intersectional feminist Instagram account to follow, check out Brazilian artist Marcela Sabia (@Marcelailustra). We’re not sure why it took us this long to even stumble across her (shout-out to theladiesfinger.com!) but we’re sure glad we did. With so much depressing political news filling up our feeds almost every day, we’re becoming increasingly drawn to the work of artists and activists who are using their platforms as a form of resistance, to spread positivity and remind us of the values that are important. 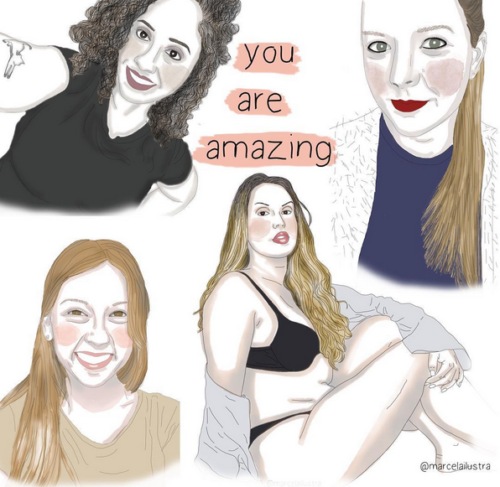 Marcela’s account is filled with her colorful, bold images with messages that cover a range of topics including mental health, sexism, self-care, body image, and a few self-images and inspiring quotes thrown in the mix. Among the images, we can see differently-abled people, different genders, ages, ethnicities, and religious affiliations represented. 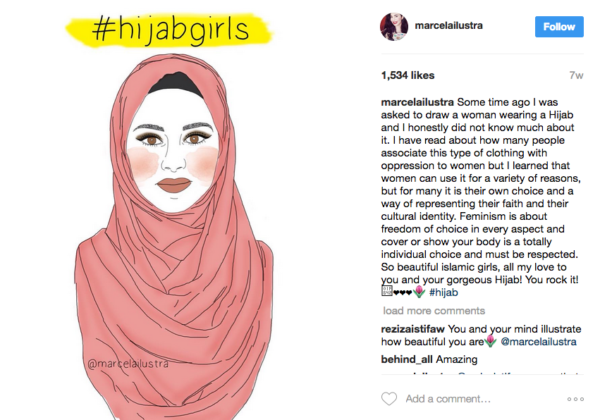 Intersectionality is important, and Marcela has been consistently posting her work on her account for the past 2 years. With a dedicated following of over 22,000 followers, clearly she is striking the right note among her fans. In an interview with the National Eating Disorders Association (NEDA) blog, Marcela said she gets her inspiration from a range of places including conversations with friends, documentaries, Pinterest, the internet, or even drawing from her own experiences, which is why she is passionate about being open about mental illness. “When you suffer with mental illness, you feel that there is no one like you in many moments and this only adds to the pain. So I think that makes them feel part of a community and know that they are not really alone. I very much hope that in the future, the stigma surrounding mental health will be something overcome by society. That people have no more fear, shame, or any problem in admitting that they have a mental illness and are not judged for it. May they be treated as naturally as any person suffering from physical illness,” she told NEDA’s communications associate Diana Denza. Living in Brazil, Marcela says there aren’t as many body-positive websites or communities online like there are in the United States and Europe, but she hopes to see this change. “There is still a very strong culture around the ‘gym body’ and society expects women to fit into this pattern – hot women with skinny bodies worthy of a beach bikini. 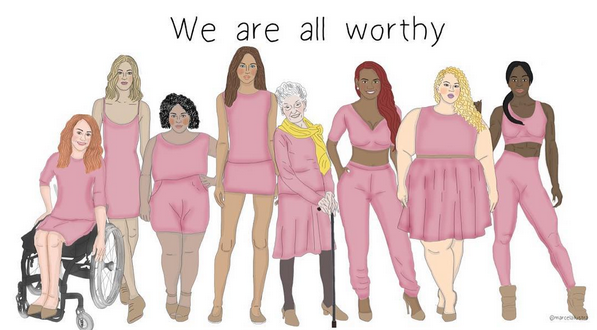 The word fat still has a very negative connotation around here. As for mental health, things are a little better, but there is still a lot to improve. I see some people talking openly about it but most still hide for fear of judgment. There is still little information and a prejudice about mental disorders that needs to be clarified and discussed,” she said. Marcela also talks about her feminist awakening, and the journey she is on to continue learning about the movement as a whole. “I had an awakening when a long relationship of mine ended. I realized there was sexism around me that I had not noticed before. This person had cheated on me and I had to hear people ask me what I had done for him to look for someone else and that “that is the nature of men.” From then on, I also had a series of experiences that began to awaken in me the desire to contribute to the equality between the sexes and the extinction of outdated concepts,” she recalled. This is probably why she includes so many powerful messages about women being unapologetically themselves in her artwork, exposing micro-aggressions and dismantling harmful misogynistic trends that permeate our culture around the world. Given that she is a feminist existing in an online space with a large following, we’re not surprised that she gets negativity from certain people. Marcela has even shared some of the comments she has received with her community publicly (n.b. to trolls, if you have to practice your hatred in secret toward someone with considerable amount of followers and supporters, have the guts to do it in public or expect to be exposed). In an interview with ProjetoCuradoria.com, she says it reflects more about the insecurity of the person doing the trolling than her work itself. “I get negative and even offensive comments about some of my work, mainly because I’m a feminist and I talk about controversial things. It is still hard for some to accept that there are women expressing themselves without fear and expectation of approval,” she said. A quick scroll through some of her posts (we have shared some of our faves in this piece) and you see the overwhelming amount of support and gratitude her followers continually share with her. What Marcela is creating is a positive light in what can be a very depressing and angst-ridden space – social media. 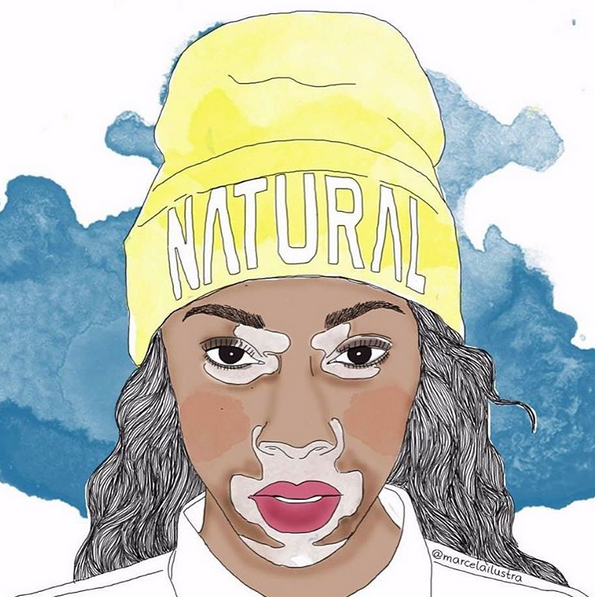 She has a message for others who are struggling with eating disorders or mental illnesses. “Look for inspiration, for examples of people who have overcome their disorders and continue to do this every day. Meet the people who participate in the bopo community and open your minds to what these people have to say and teach. 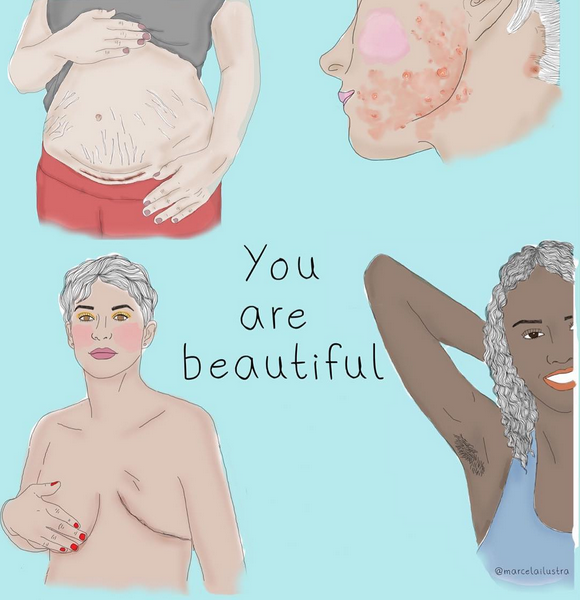 The same goes for those who want to love their bodies: learn from people who are already farther on this journey and remember that one day they were at the same point that you are today. 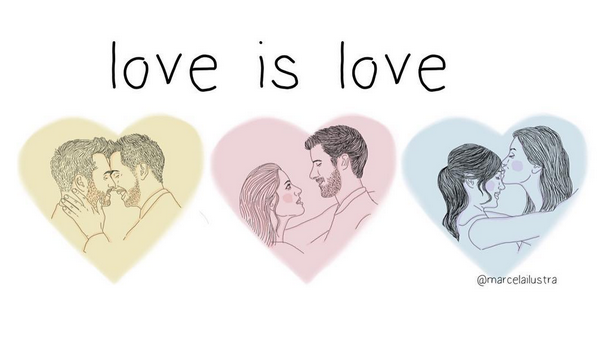 We all have to start somewhere and there are no requirements for self love,” she said. We encourage you to follow Marcela on Instagram, and take a look at more of her work on her website.